Many investors use indicators. Popular fundamental indicators include the price to earnings (P/E) ratio and the dividend yield. Popular technical indicators include moving averages and the relative strength index or RSI. Less popular are economic indicators. When investors do consider economic indicators, they often look at the so called headline numbers. This might include the unemployment rate or an inflation report. Even less well known are obscure indicators like the ECRI Weekly Leading Index. “A century-long tradition of business cycle research gives ECRI a singular perspective on the ebb and flow of the economy, even in the face of unexpected shocks. Our approach is informed by the fundamental drivers of economic cycles. It is an approach pioneered by ECRI’s co-founder, Geoffrey H. Moore, and his mentors, Wesley C. Mitchell and Arthur F. Burns. In 1950, Moore built on his mentors’ findings to develop the first leading indicators of both revival and recession. In the 1960s he developed the original index of leading economic indicators (LEI). It is a testament to the quality of that breakthrough that, nearly half a century later, many still believe the LEI and its variants to be the best tools for cycle forecasting. The ECRI Leading Index is shown in the chart below. This index has a moderate lead over cyclical turns in U.S. economic activity. Historical data begins in 1967. The indicator is designed to predict the timing of future changes in the economy’s direction. 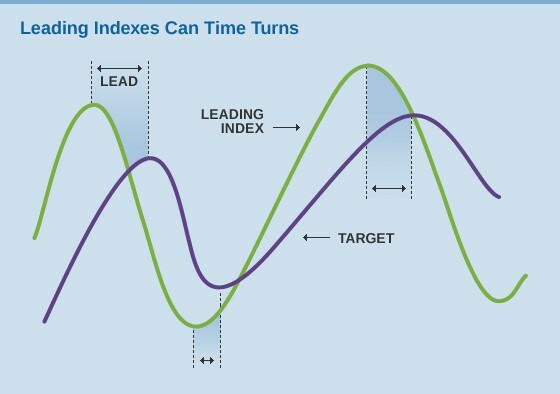 The Leading index is intended to “signal those turns before the fact, and well before the consensus. 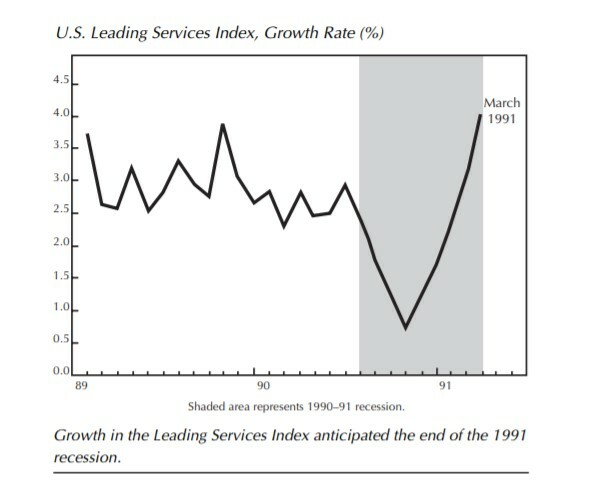 ECRI’s focus is on identifying when those changes in direction will occur.” An explanation of a leading index is shown next. To help assess where we are in the cycle, it is common to consider the year over year change in economic data. That change is shown in the next chart. The year over year change is now below zero, an ominous signal for the economy. ECRI has warned that the economy could be approaching a recession. The problem is … the cyclical drivers of economic growth continue to wind down, meaning that the slowdown is set to continue. That’s the objective message from the same array of leading indexes that we used to predict the current U.S. economic slowdown in the context of a global slowdown last year. 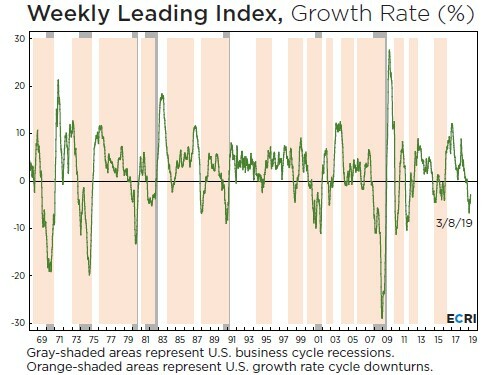 A case in point is the publicly available U.S. Weekly Leading Index, whose growth rate remains in a cyclical downswing. If the U.S. slowdown continues until the opening of a recessionary window of vulnerability, within which almost any negative shock would trigger recession, it will be too late for the Fed to head off a hard landing, as it was before the 2001 and 2007-09 recessions. ECRI is an independent research group and their work is highly respected. They have back tested their indexes and have an impressive track record. One example shows how their research worked in the past, correctly identify the turning points in the early 1990s. Investors who heeded that caution could have decreased their exposure to the stock market and avoided some of the decline that marked the fourth quarter last year. “Today, our research shows that the U.S. economy is approaching a recessionary window of vulnerability. But it isn’t yet in that window, so the economy remains relatively resilient to shocks. Therefore, while our lonely forecast last year of a cyclical slowdown in growth has now proven correct, it’s premature to conclude that a recession is imminent. This data has been delayed by the government shutdown. Some economists question the data as it is released believing that there could be problems with data gathering associated with the shutdown and are waiting for revisions. 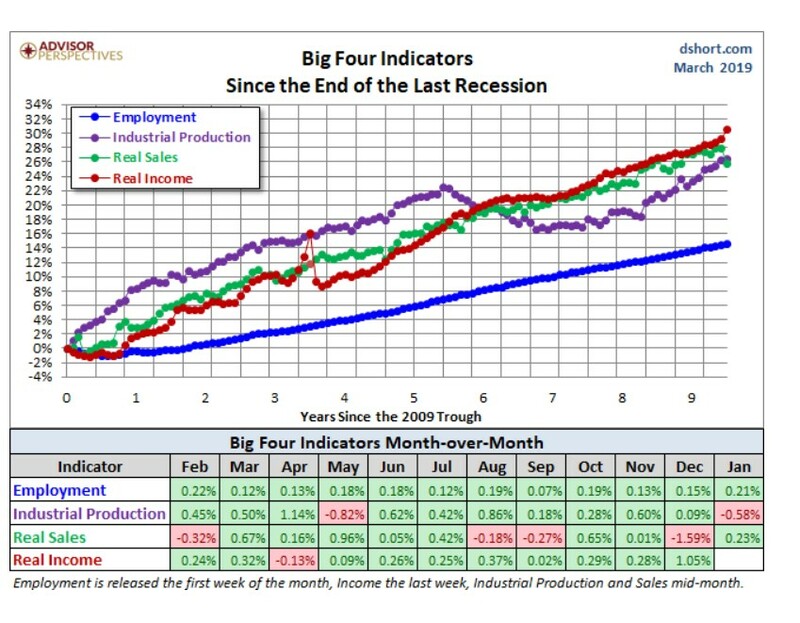 But, for now, the big four are supportive of an economic expansion even if the picture is weakening. As ECRO notes, a recession isn’t imminent, but it’s not off the table. That means investors should be attentive to economic indicators, even if it is not popular to do so. Watching for signs of additional weakness could help investors avoid a sharp downturn in the stock market that often accompanies recessions.